…er from Blackheath Halls, and many of us attend functions there and see the quality of the performances etc. These are very dark days for the arts in the UK. I think not only have we had to make difficult decisions in Greenwich, we learned today that something like 300 organisations across the UK, I think 5 in Greenwich, have had their funds cut by the Arts Council. So in that regard, it’s a very depressing time. <In particular and the Friends representing here this evening asked some questions about the difficult choices the council had to make, both in respect of Blackheath Halls, the theatre, and Greenwich Dance Agency. In respect of the theatre and Greenwich Dance Agency, had we decided not to fund one, or the other, or both, we would find ourselves in a position where we would have two empty buildings on our hands, because they were buildings owned by the council. And that of course would be even more difficult, in the longer term. In respect of Blackheath Halls, as I understand it the Blackheath Halls covenant has been purchased recently by Trinity Laban and obviously their performing arts are going to use the hall more extensively. And obviously that is a matter for them. But if the Friends look at paragraph 3.51 and paragraph 3.5.2, it relates to the fact following representations and all due scrutiny, cabinet has set aside a sum of £42,000 to support the delivery of community based and participatory projects across the borough. 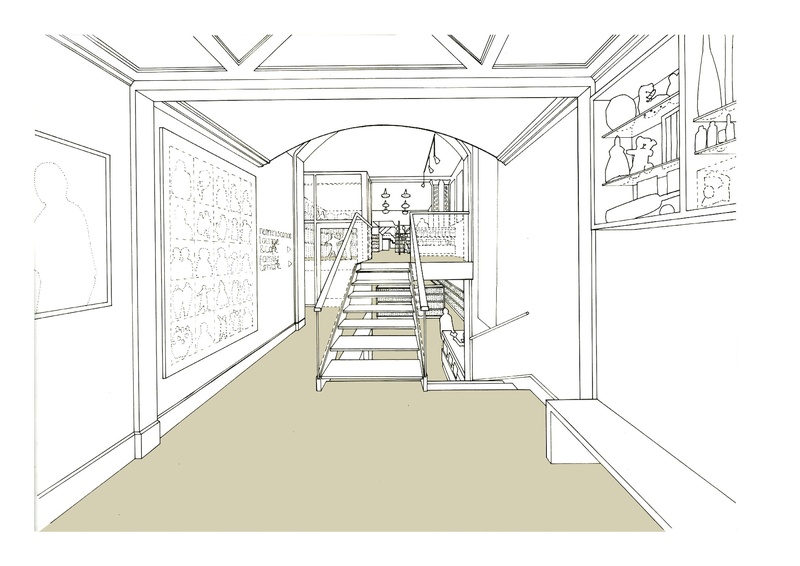 And I would urge strongly for Blackheath Halls to seek to keep that going. I’m very happy to meet friends of the Blackheath Halls because I think for any of us, we want to ensure that, at least here in Greenwich, as we move towards the Olympics, the Cultural Olympiad 2012, we don’t want any lights out in any of our quality buildings, and I very much hope that, with all of our joint efforts we can hope to keep Blackheath Halls, and lift its contribution to the community, which is set out very well in the programme that the Friends have very kindly circulated. Someone at Lewisham council has just uploaded a tonne of really brilliant old photos of the area. Most are of Deptford, Lewisham and New Cross, but there are a few Blackheath ones too. The whole set are highly recommended. There are very few details about each photo though, so if you have any info about them, it’s worth adding the comments to their photo gallery. They’re all creative commons licensed too, which is great, as it means that you can remix them into weird little videos showing Blackheath through a timewarp, for example. It would be great if Blackheath Society did the same thing with their photos. They’ve got loads of old photos too, but very few are on the website. Does anyone know if the Sainsbury’s photo is from Blackheath? I have a feeling that Shepherd’s used to be a Sainsbury’s years ago? UPDATE: According to Blackheath Village and Environs, 1790-1970: The Village and Blackheath Vale v. 1 (p54) Sainsbury’s occupied the travel agents building. One of only 100 opened between 1892 and 1914. It closed in February 1959. 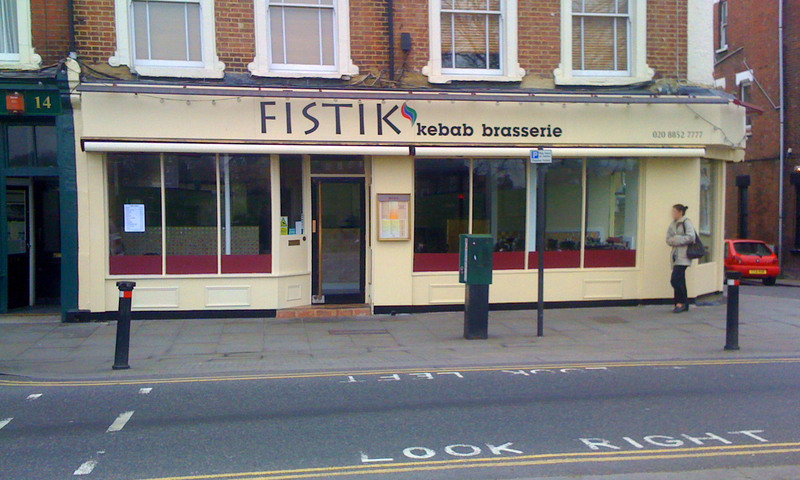 As mentioned in a previous post, the restaurant next to Buenos Aires Cafe has turned into Fistik Kebab Brasserie. Leaving aside whether “kebab” and “brasserie” should ever appear next to each other, the food is actually not bad. We went last weekend (Mrs Bugle and myself, plus another Turkish friend). The meze (hot and cold small dishes – not necessarily starters), were fine, and the kebab (I’m told) was nice too. The decor still looks a little unfinished in places, and they’ve kept the large-breasted statues that were a “feature” of the previous incarnation. On the whole though, it’s a big improvement. The music was pleasant, gentle, slightly melancholic Turkish pop songs floating in the background, and if you sit looking towards the Bookshop on the Heath, you can see all of village life wander by. The service was friendly, but not over-friendly. We asked for Turkish coffee, but they didn’t have any – they promised that they’d get some in soon, but the espresso was fine. Be sure to check out the exhibition they’re having to promote “Blackheath Quarter”. Just make sure you don’t call it the Ferrier Estate. 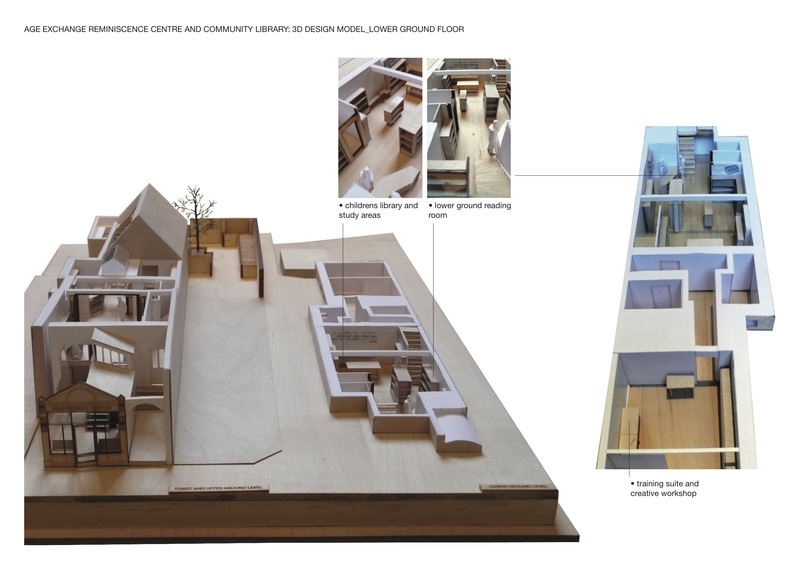 The Blackheath Village Residents Group has put out an email newsletter, containing more details of the planned library inside Age Exchange. It’s a series of pdf files explaining, among other things, who you should thank for these plans. I feel it’s my duty to mention that the BVRG would really like you to attend the next Blackheath Assembly. So would I. It will be held at 7:30pm on Thursday, 31st March, at St Matthew Academy, St Joseph’s Vale, Blackheath, London, SE3 0XX. Here’s a Google Map. They’d also rather like you to not discuss anything at all about the music festival on this blog, ok? There is currently a lot of discussion about the NIMBY event application on the Heath, not least by mostly anonymous contributors to the Blackheath Bugle blog. The BVRG view is that these matters are best discussed openly in public forum. An opportunity to do so is at the next Blackheath Assembly meeting. No more idle chatter over here, hmm? That sort of thing causes trouble, and trouble we do not like, ok? Good. Glad that’s sorted. As you were. In seriousness, I totally agree that the best way to get local issues resolved is probably face to face in a public forum. That doesn’t mean that an anonymous forum (like this) has no value. It’s just a different kind of forum. Which is why the Age Exchange Library arrangement sits uncomfortably. 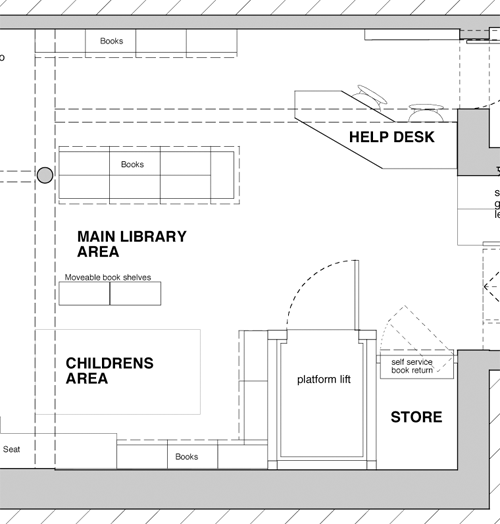 I don’t want a library in a windowless basement. I want the library that our council is obliged to maintain, without any back room deals made in smoke filled rooms with property developers. NB: I realise that there is a mobile bookshelf, and a couple of other shelves in different rooms, but 5 bookshelves had a nice ring to it. 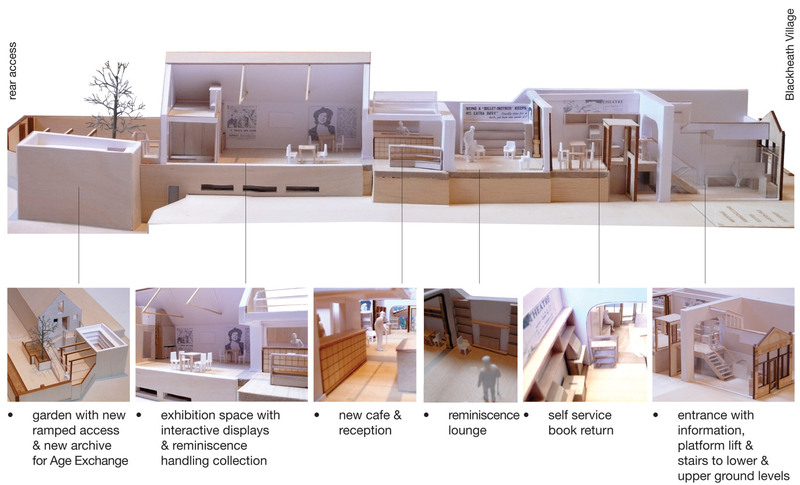 It’s still tiny when compared to the existing library. UPDATE: As pointed out in the comments, it appears that this photo was taken in 2007. 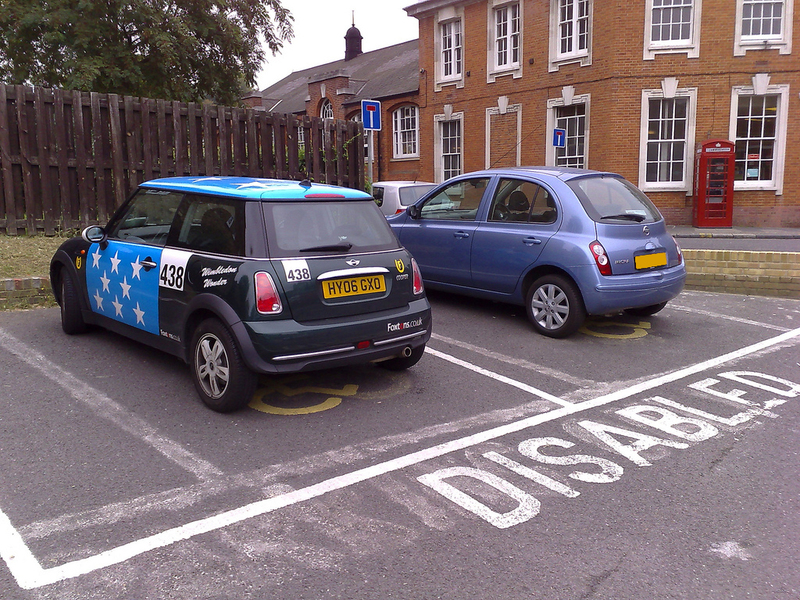 Photo showing Foxtons mini clearly parking in the disabled space outside the Post Office. 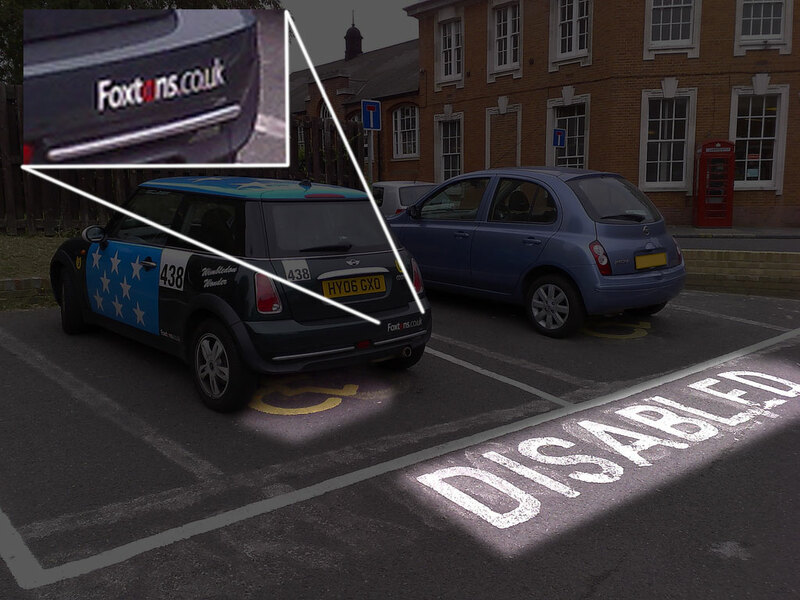 I guess it’s possible that the Foxtons employee is disabled, and was just nipping to the post office. Anyone know? The concerns raised in the leaflet from a few months ago about their lack of parking spaces appear to be valid. Greenwich Council don’t allow businesses in Blackheath to have internally illuminated fascias. They don’t have permission to use illuminated outdoor signage. Foxtons seem to be ignoring that. They’re also ignoring the fact that they don’t have permission to trade at weekends as per their planning consent agreement. We live nearby – at the top of Lewisham Hill, and are writing to you as neighbours. We don’t belong to any group. 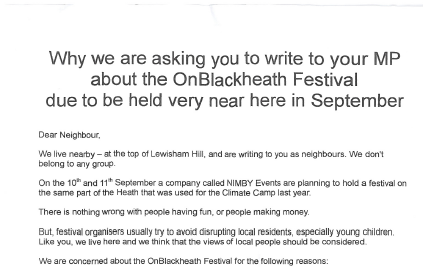 On the 10th and 11th September a company cailed NIMBY Events are planning to hold a festival on the same part of the Heath that was used forthe Climate Camp last year. There is nothing wrong with people having fun, or people making money. But, festival organisers usuaily try to avoid disrupting local residents, especially young children. Like you, we live here and we think that the views of local peopie should be considered. Once the music and drinking stops, late on Sunday night, up to 25,000 people will be encouraged to head down Lewisham Hill to the station. Many will presumably hang around until later. We do not have assurance that the organisers will have managed to clean up by the next momlng, when children walk across the heath to get to school. At other festivals it is not unknown for broken bottles, drug paraphernalia and other detritus to be found the next day. The reason we’re writing to you is that the alcohol licence – which was granted for this and every subsequent year – has been challenged in court, and the festival might also need ministerial approval. So there is a short window of opportunity between now and the hearing on April for local people to make their views known. This may make all the difference, as the local MP, Heidi Alexander, says the letters she has received so far have been roughly half in favour, half against. At the recent public meeting we asked the organisers if they would consider moving the Festival out of school term time to the summer holidays. They said no, because it might reduce attendance numbers. You can email Heidi Alexander MP, at heidi.alexander.mp@parliament.uk or write to her at Heidi Alexander, MP for Lewisham East, House of Commons, London, SW1A 0AA. If you can, please do it before 15th April while there is still chance to influence the decision. It will be interesting to see how this plays out… I suspect the festival will go ahead regardless.